It has been eight days since this Step-by-Step Starter from Scratch project was posted on Day Seven and here is where the boys stand right now. After about 5 days of twice a day feeding at 15g:30g:30g [S:W:F] for a total of 75g, I’ve reduced them further and they are now at 10g:20g:20g, a total starter size of 50g. Although this amount may seem small, it would actually allow, from the excess, 30g of starter which is all that the Vermont Sourdough recipe needs, still leaving 10g more of extra starter. So this is still plenty and means there’s less flour needed or discarded. Any recipe that required more starter would simply need that 40g of “excess” built up to the necessary amount a day or so prior to baking. That 40g can immediately be built up to 200g in just one feed using 40g:80g:80g. At this point, they’ve both equalized in the “tartness” area as well in their in the jar expansion ability. Their flavours are pretty much the same so whatever differences their original mixes steered them to has now pretty much gone. I’m going to give these two another week of twice-daily feedings which should help them develop their character nicely, although that in reality should keep improving over the next few months, if they were kept out and fed every day. At the end of that week, I’ll then run a test bake, making three loaves of Vermont Sourdough making one loaf with each starter and a third using my current starter, Carl of Oregon. Based on these results, I’ll keep whichever starter is best as the refrigerated “mother” and dry up the other(s). Last Update: After aging and making a couple of loaves from both starters, seems there was no discernible difference in proofing ability or flavour so I chose to keep PJ while Wally made tasty pancakes. I also used one feeding discard to dry up some flakes as a “back up” precaution. So until further notice that a new starter is on the go, any sourdough starter I use from here on will be PJ. Wow, I ‘ve just read my way through your tutorial. It’s a great piece of work. I’ve bookmarked it for future reference and hope it’s ok to link to it when people ask me about making starters as I don’t think I could improve on it! I’ve never tried drying out the starter to flakes, does it work? Yes, it’s easy, just spread some (may want to thin it out first for thinner flakes) on parchment or wax paper and give it a few days to dry. Collect, crunch up and store in plastic zip bags, add date & pet name. Presto, you have back-up “snapshot” of the current starter to fall back on or share. Can I ask what your maintenence schedule is? Are you storing in the fridge and feeding weekly at 1:2:2? My maintenance schedule is feeding every week or so, sometimes two weeks. I try to keep it to a “Friday night feed” so that it becomes routine and less likely forgotten but if life gets in the way, I don’t have an issue letting it go two weeks. If I know I’m making bread this weekend, I’ll take the starter out Friday (or if it’s lucky, Thursday) give it a feed (or two) and use the excess* as the basis for the starter build in the recipe. If it’s just a feed and there’s no sourdough bread to make, then it gets fed at 1:2:2 (10g:20g:20g) and I use warm-ish water to counteract the fridge temp of the old starter. After it’s had a few hours to start increasing on the counter, it goes back in the fridge. * I never use the starter itself in a recipe and just “hope” I remember to keep some back; that would pretty much guaranty I’d lose the starter. Thank you for your detailed account of how to make a starter from scratch. It has been a great help to me esp when the qty is expressed in grams. So your final starter of 50 grms at ratio 1:2:2: is not a 100% hydration starter. For example, after I have taken 20 g the 50 grms baking, can I bring the remainder of the starter back to 100% by feeding 30 +30. I’m totally new to baking with sourdough starter and would very much like to give this a try.. Thank you. Well, yes, if you feed 30g each of flour and water, to ANY amount of old starter, that’s still 100% hydration since you have 100% of the flour’s weight in water. This doesn’t change if you’re adding it to 30 grams of old starter, or 10 grams or 482 grams. Equal weights of flour and water, no matter the actual weight, if equal are 100% hydration. If you take 30 grams old starter and add 30g water and 30g flour, you have a 1:1:1 ratio. What you’re perhaps doing here is confusing the feed ratio with the hydration; they are two separate things. The feed ratio could be written as 1:4 instead of 1:2:2 since we’re feeding 1 part old starter with 4 parts fresh food. By using “2:2” we are specifically noting how much of that “4” is water and flour: equal amounts. Otherwise if we just wrote “4”, that could be made up of 1 part flour plus 3 parts water (not 100% hydration) or .75 parts water and 3.25 parts flour (still not 100%). So to keep things crystal clear, we state “2:2” to show the water to flour amounts. For a 1:2:2 ratio, whatever that “1” weight happens to be, you add two times that weight in water plus two times that weight in flour. If you take 20g out of your 50g starter, you’re left with 30 grams of “old” starter which we already know is made up of 15g water and 15g flour. To keep to the 1:2:2 ratio, we would then need to add 60g water and 60g flour. This then gives us a 1:2:2 ratio or, said in exact weights, 30:60:60 grams. Of course, you’re now up to 150g of total starter and if your normal recipe needs only 20g, this may be more than you want to keep. Stick to 10g:20g:20g and you’ll have enough for your bread and hardly any excess to cut back. 150 grams of starter would be good to keep if your regular recipe(s) wanted 120g of starter, leaving you with 30g to feed again. Thank you again for your explanation on ratios. I think I may have finally produced a starter. It’s two weeks since I commenced my starter project and Ihave been feeding it twice a day using a 1:2:2 ratio in the last couple of days, following your schecule.. I’ve done a test this morning with my discard at 1:2:5;:2.5 ratio and it has tripled in 4hrs so it’s looking promising.. Now that I understand how ratios work, I have a 100% 60 gr. hydration starter, I have seen recipes that specifies a starter at 75% hydration, in this case, would I then feed , say 20g seed/ 30g.water/ 40 g. flour, thus making this a 90g starter at 75% hydration? I’m terrible with calculations and would like to make sure that I understand how I should calculate hydration %. Many thanks. My starter is a thick, liquid paste which can only be scooped/poured out, not something that can be torn up into pieces (as some book specifies). before use. Have O dpne something wrong with my feeds. Thanks a lot. A 75% hydration starter falls under the firm or stiff starter category, some of which can be 60% or a stiff dough consistency. These would be “in chunks” as you might pull a chunk of bread dough when making a loaf. I asked Jeffrey Hamelman about this recently and he told me that at his shop, they only keep two kinds of starter: a 125% (his preferred hydration) white starter and a firm rye. Any formula that needs “other consistencies” are made from these and the missing or extra flour/water is adjusted when building the levain. His view, which you can read in full here, is that it won’t make a whole lot of difference in your final dough since you actually use just a teeny tiny amount to make the levain build which then goes into an even larger dough. If you were, for example, going to use 40g of “stiff” 75% starter to build a levain of, say, 350g, that 40g should be about 17g water and 23g flour. Let’s say you had 100% starter on hand so 20g water and 20g flour. That’s a difference of just 3g each. If that 350g levain build then becomes part of a 1500g dough, that 3g of water and flour is hugely insignificant. You’ll have picked up that much or more in flour just from working the dough on the counter or couche. In other words, don’t fret about it. Keep to 100% if you like it (it’s so easy to know what the flour and water quantity is) and, if you want, add a bit more flour or water to “guestimate” the right consistency, should your recipe want stiff or very liquid (i.e. 125%) starter. But word is, it won’t really make enough difference to worry about. Thank you again Paul for your advice. I’m more than happy to keep mine at 100% simply because it’s just less hassle and easier to calculate the amt of water needed. Thank you so much for documenting this! 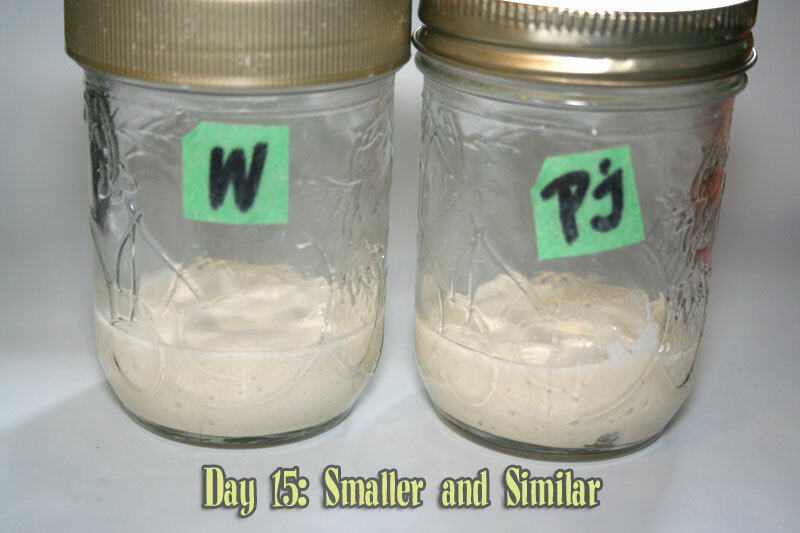 I wanted to make my own starter and hadn’t it be for your series of posts I would have thrown out my water and all purpose flour starter at day 4. For some reason many posts out there don’t mention the whole bacteria/acidity/late yeast surge at all, so during those 2-3 days of sleeping one really starts to wonder if the whole experiment just failed. My starter went from smelling like vomit on day 2 to smelling like yogurt on day 4 to smelling like fresh bread on day 7. Thanks for the good report on your experience. That was really one of the major reasons for putting this tutorial on the blog. Aside from simply documenting my own process, of course. Letting other see what can happen and hopefully explaining why should assist people who are a bit reluctant to start or who do but then run into issues. Now they know that it’s not so simple as just “Mix a cup of water and a cup of flour and let it sit four days” BUT that it’s also not that complex, once you have a better idea what’s really going in in the microscopic world of starter colonization. Keep us posted on how your breads turn out!